In recent years, one of the achievements I have accomplished is the rescue of a beautiful butterfly cabinet that was destined for the rubbish skip. 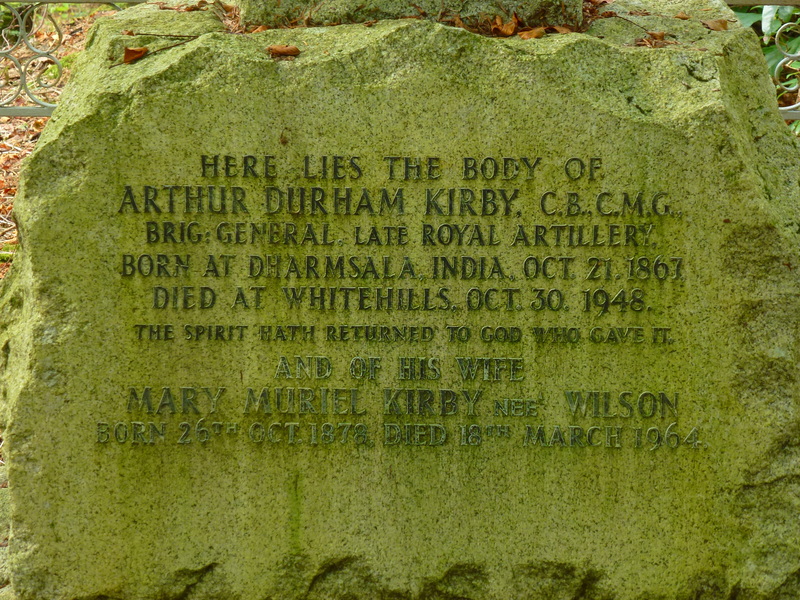 The story begins long ago, when my father was given three wooden boxes of Indian butterflies and one of hawk-moths by Brigadeer-General Arthur Durham Kirby, CB CMG, late of the Royal Artillery. 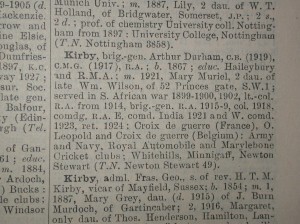 General Kirby had had an illustrious military career in the Boer and First World Wars, being awarded the Croix de Guerre in both France and Belgium, as well as the Order of Leopold in the latter country for his service towards their liberation. 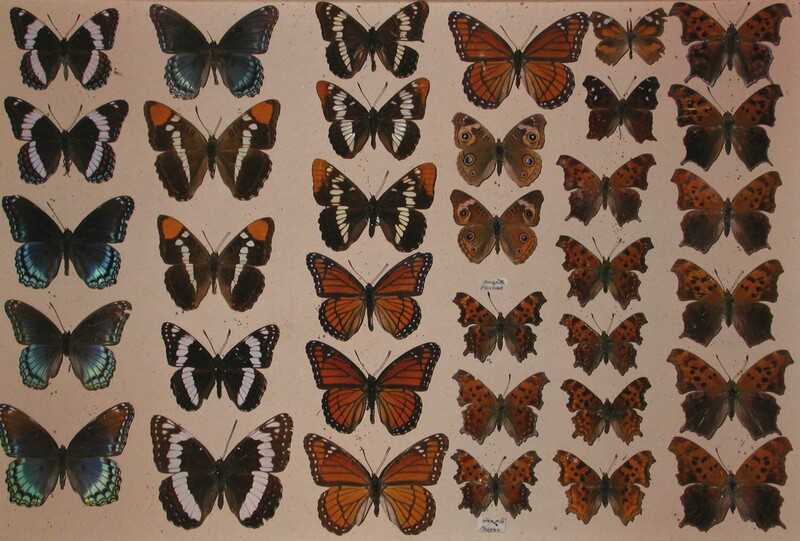 In his spare time, Gen. Kirby was a passionate butterfly enthusiast, not only collecting himself in India, but he also had a team of collectors around the world, all of whom sent him back material from wherever they were based, allowing a collection to be built up that incorporated butterflies and moths from North, Central and South America, Australia and New Guinea, the Dutch East Indies, Formosa (now Taiwan), Japan, other parts of India, Europe and a few from Africa and Madagascar. 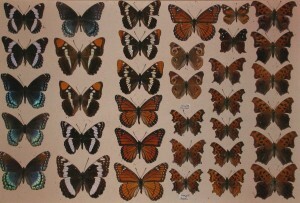 The specimens were virtually all caught between 1899 and 1912, although a few date back as far as 1877. As with so many ex-colonial butterfly collectors, late in life with failing eyesight and shaky hands, he could no longer work on his collection, and the inevitable question arose of what was to become of it. 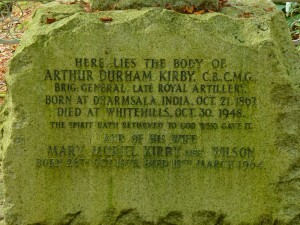 Having settled with his wife Muriel and numerous dogs close to Newton Stewart, in Galloway, and knowing that my father, then aged 13 and separated from his parents, who were also in India, was interested in butterflies, Gen. Kirby bequeathed those four boxes to him, and donated the main part of the collection, namely the 50-drawer mahogany cabinet, to the local high school. 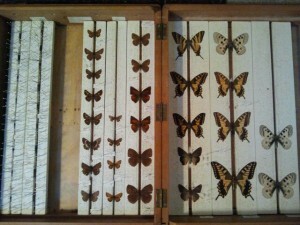 As a young child, I was fascinated by those four wooden boxes, with their mothball smell (insect specimens are usually protected from museum beetles and other pests by charging the boxes with naphthalene or camphor), and I used to dream of the exotic locations in southern India where the butterflies had been caught. Later I came to inherit my grandfather’s Indian and African butterfly collections, plus those of a great friend of my grandparents, Meynell Hackney, who had worked for ICI in India. 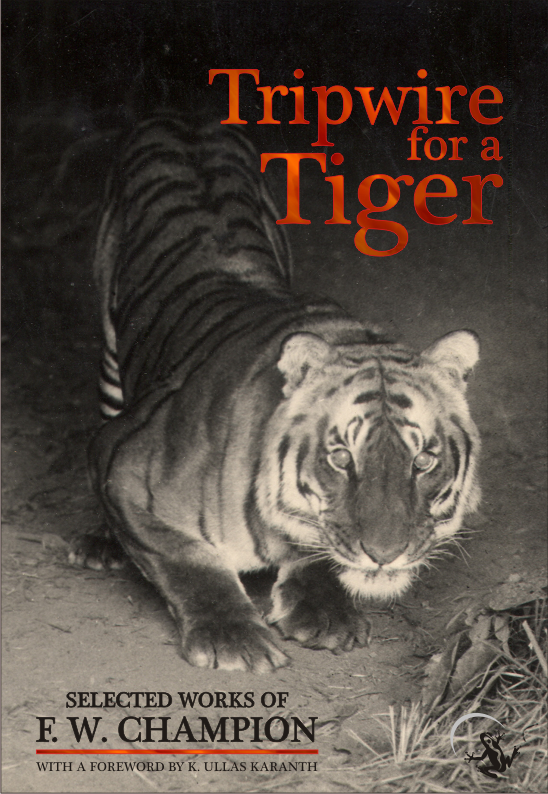 Poignantly, the collections of no fewer than four of his friends, all of whom were killed while fighting the Japanese in Burma, came with his butterflies, so I became the custodian of thousands of specimens, mostly caught between 1920 and 1955. Perhaps one of the activities I enjoy most of all when at home is setting and identifying these insects, and the knowledge I have gained from handling and examining these ancient specimens means that I am now able to identify many of these species when I finally see them alive, whilst on my travels in the tropics. 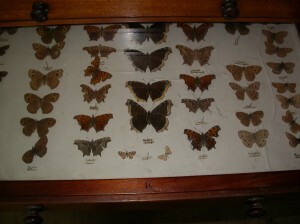 Towards the end of 2009, I became curious about what might have become of that long-lost cabinet, so I contacted the school, and asked whether they had in their possession an ancient butterfly collection. And indeed they did, but they were just about to dispose of it. 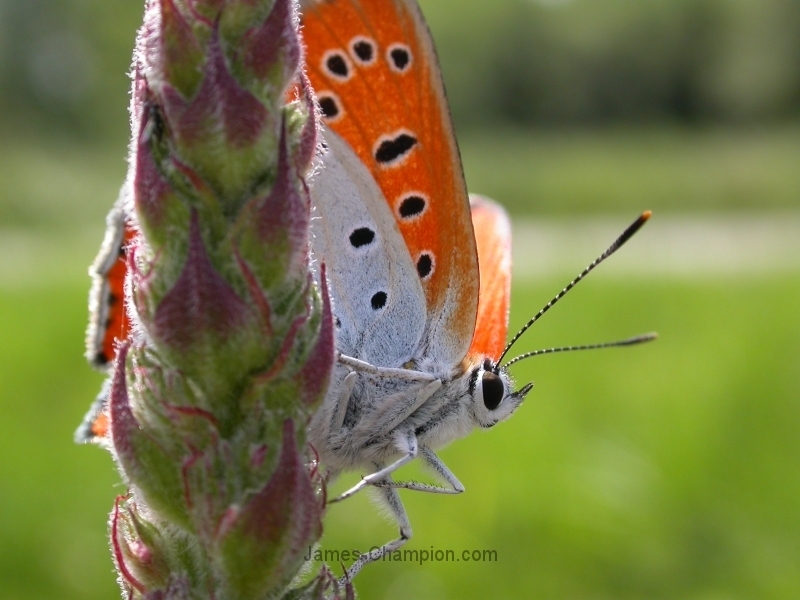 It is no longer considered acceptable by many people that butterflies should be killed and impaled on pins, and children do not like to see such things, I was told. 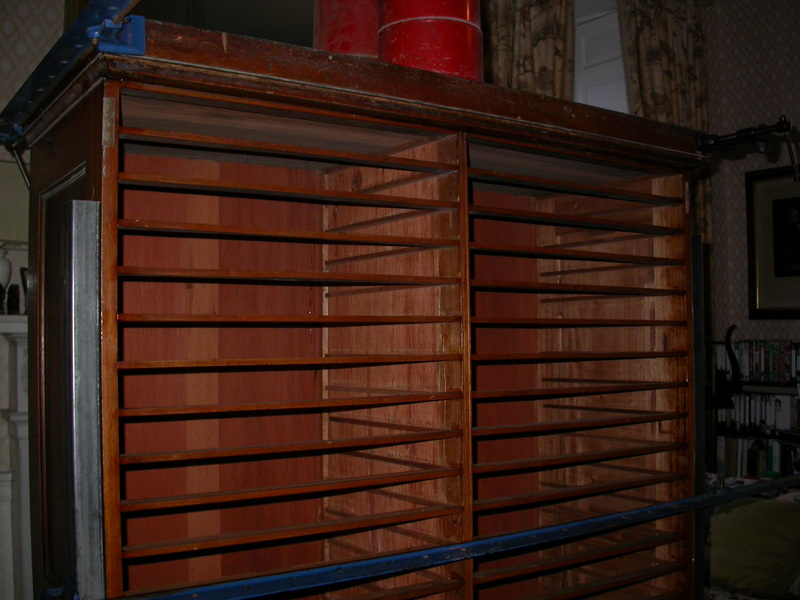 In addition, the cabinet was housed in a building that was about to be gutted and re-built, and it would have taken up useful space in the new classroom. Consequently, a debate had been taking place over what to do with the collection, and in the absence of anyone volunteering to take it on, it was destined for the skip….until I appeared. 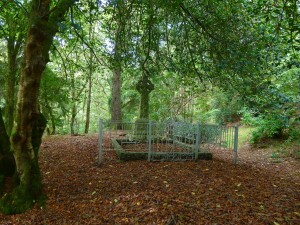 On Christmas Eve 2009, I was welcomed into the school by a geography teacher, Donald Cameron, who showed me the cabinet, which although many of the butterflies’ wings had broken off and numerous pins had oxidised, splitting the bodies of the butterflies open, considering the fact that it had had to deal with the prying fingers of generations of curious school pupils, it was not in too appalling a condition. The drawers had glass lids, which had no doubt protected the specimens from what would otherwise have been much more severe damage, and some had comments written with fingers in the dust on the glass. When I explained that I was the guardian of the four boxes that Gen. Kirby had presented to my father in 1941, Mr Cameron suddenly said that he thought the best solution to the question of what was to become of the collection would be for it to be reunited. Needless to say, I was delighted, but he informed me that such a solution would have to be approved by the Head, who would not be likely to be back in the school until well after the New Year, by which time I would need to be back at work in the Netherlands, and that the cabinet was due to be disposed of early in the new year. And so I became the guardian and curator of yet another collection of musty old insects, but the question remained, how was I going to transport this large and cumbersome piece of furniture home, not to mention the drawers with their extremely fragile, brittle contents? Clearly nothing could be done on that freezing Christmas Eve, but over the next few days, my mother came up with the brilliant idea of asking the local undertaker, who also happened to be a carpet supplier and fitter, whether he might be able to help. After all, as my mother said, he was used to transporting wooden boxes containing dead things!! Well, it turned out that he was indeed willing and able to help, and when I was next home in my February half-term break, a team of us removed all the drawers, and gently lifted the creaking cabinet, which was very unstable without its drawers, into the carpet van (I would have preferred the herse, but the cabinet was not quite the right shape), and strapped it upright to prevent accidents when going around corners. The drawers were transported by car, five at a time, cushioned with duvets and pillows to limit damage on the potholed Scottish roads, and eventually the entire structure was re-assembled in our home, and the drawers replaced one by one. 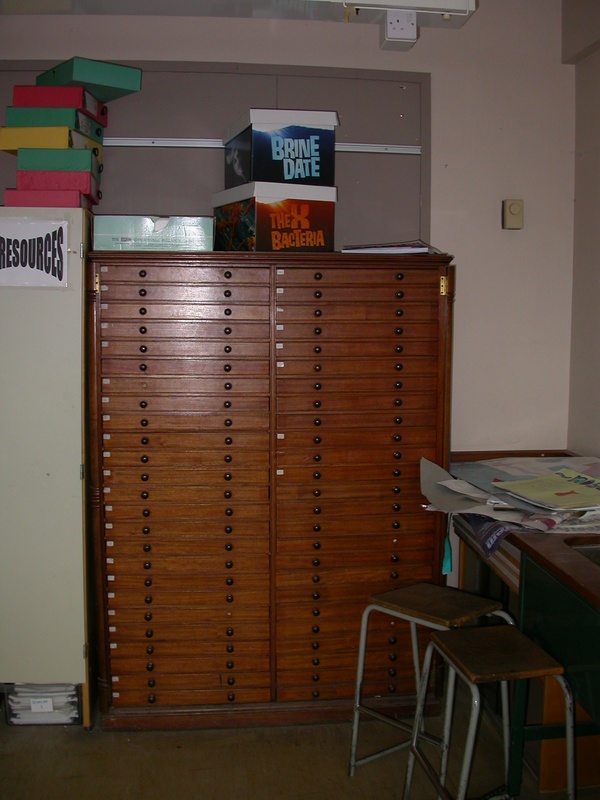 Over the years the cabinet had sat in the school, and possibly even before that, it had structurally deteriorated, and particularly the central division between the two columns of 25 drawers had sunk down, meaning that the drawers were sitting at an angle, allowing light in (causing the butterflies to fade) and making it difficult to push and pull the drawers in and out. 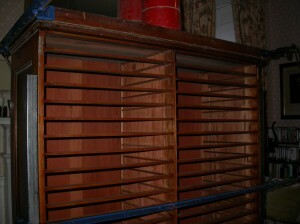 The outer shell was very unstable as well, and several of the wooden knobs on the drawers were missing. Clearly some renovation work was needed. It is sad to recount that the two absolute heroes of wood-working who sprang to my assistance in the resurrection of the cabinet are no longer with us. The first, Jim Lupton, was an astonishingly gifted maker of models and artifacts, mostly using driftwood cast up on the shore near his home. 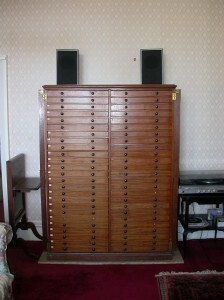 He used his turner to run off a series of replacement knobs for the drawers, the final result of which could hardly be distinguished from the originals. The other was a former aircraft engineer with De Havilland, and an all-round handyman genius, the late and much lamented (an improbably named) Basil Lockwood-Goose. Basil came over one day, well equipped with nails, extra wood, glue, clamps and other essential items, and set to a major overhaul of the cabinet. First on the programme, after removing all the drawers, was turning the entire cabinet on its head. 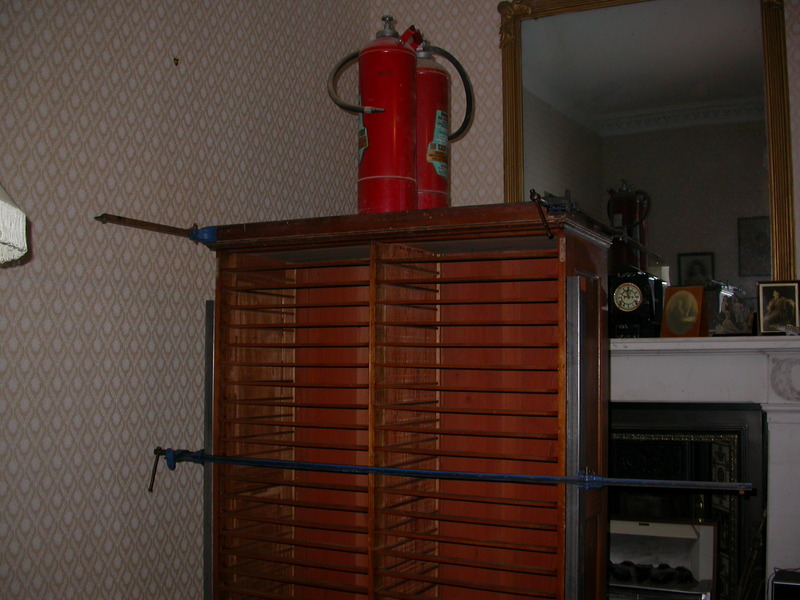 Basil then installed a new piece of wood under the collapsed central panel, and then proceeded to climb on top of the cabinet, and then whacked the bottom hard with a mallet, pushing the central sheet back into its place at the top. The new piece would later prevent it from sinking down again. My heart missed a few beats watching Basil laying into the fragile structure with such gusto, but he certainly knew what he was doing, and his objective was achieved. Further works involved re-gluing many of the fractured joins, and two large clamps were then installed to hold the structure steady while the glue set, and a couple of weeks later, Basil returned, removed the clamps, and the cabinet was righted and the drawers replaced. Since then, it has not budged, and it now stands as a reminder of these two splendid craftsmen, who were so enthusiastic about my renovation project. I have been busy renovating each drawer, with my father’s help, as the original cork sheeting has become brittle, and in some cases has lifted away from the floor of the drawer, severely damaging the specimens in the process, pushing them up against the glass lids. Rather than use cork, which then also needs to be papered, I am using a modern substitute, a white foam sheeting that is in use in most museum insect collections today, although I am also re-sticking the original cork beneath this in order to provide extra stability for the pins. The final result is most pleasing to the eye, and is less labour-intensive than corking and papering each drawer. 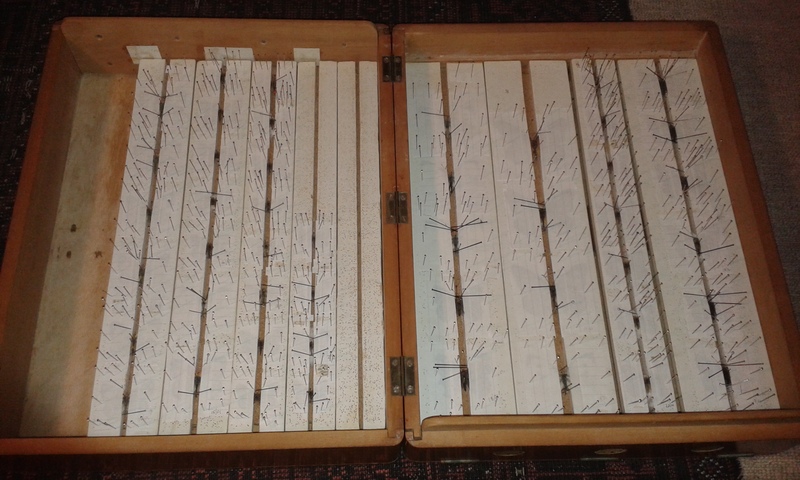 Since then, whenever I am at home, I am busy re-pinning, re-setting, re-arranging, identifying and labelling the specimens, and I have now completed around ten of the fifty drawers. 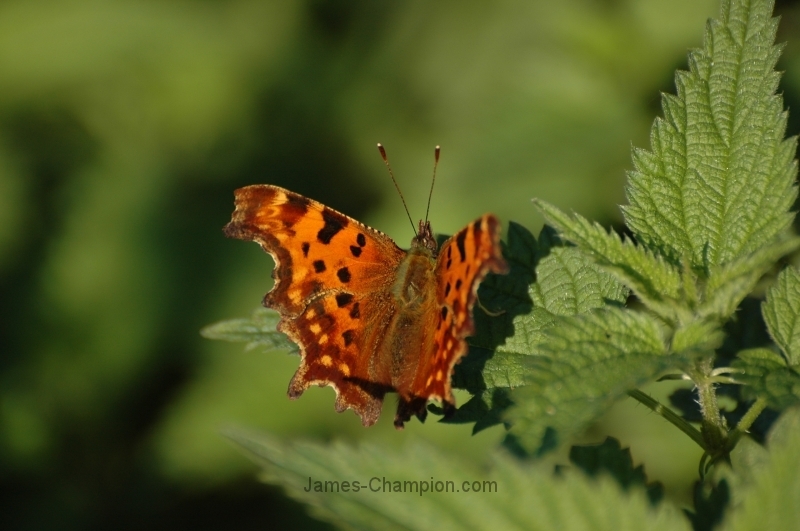 It is a long process, partly as I am mostly abroad, and partly because I can only really manage to re-set a maximum of ten butterflies per day. 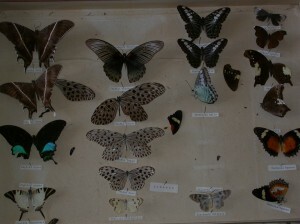 The process involves selecting those specimens in the drawers that require re-setting (in practice this is all of them, as almost all the pins have oxidised, and most of the butterflies have folded up from the horizontal position that the wings should ideally be in), and then placing them in a so-called “relaxing tin”. My version of this is a transparent-topped plastic Ferrero Rocher chocolate box. Sheets of moistened toilet paper are laid on the bottom of this, the butterflies, still on their original pins, are then placed on the paper, the lid is put on, and then left for 36 to 48 hours. 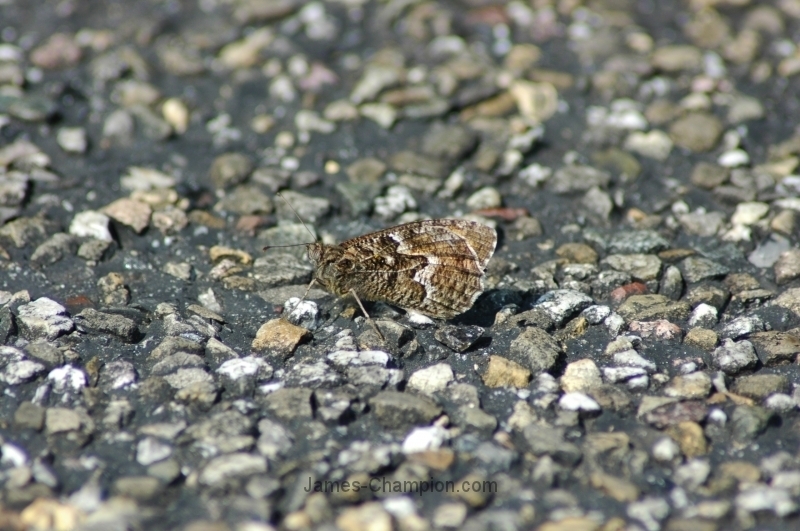 This process allows the brittle bodies, wings, antennae, etc, to become pliable again. The next stage is perhaps the most difficult: removing the original pin and replacing it with a new one, without damaging the specimen. 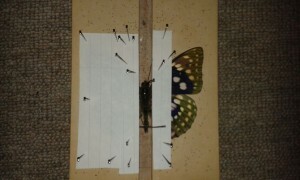 It is essential that the pin should go through the thorax of the butterfly at the correct angle, as near to perpendicular to the body as possible. 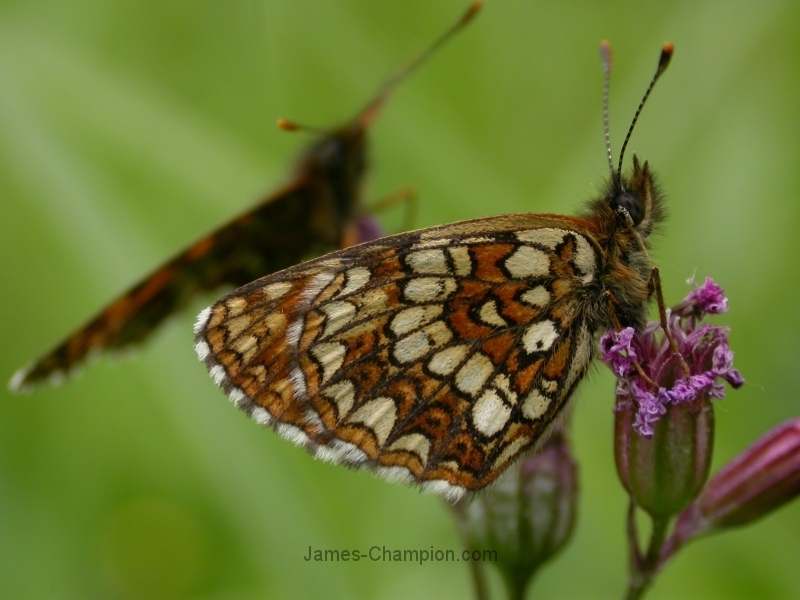 In many cases the bodies of the butterflies, more than 100 years old as they are, have been partially consumed by pests, and in that case they require a more specialised treatment. 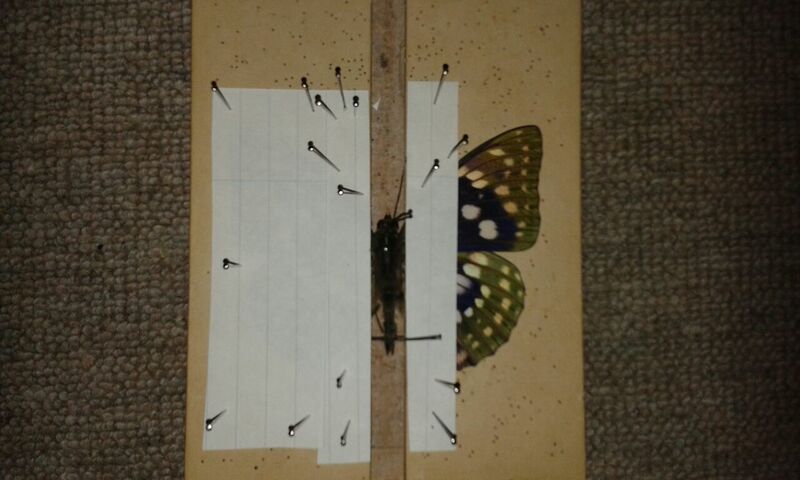 The pin, with the butterfly specimen about two thirds of the way up it, is then pushed into the central groove of a setting board. This is a wooden contraption, with a cork-lined groove running down the middle, and cork-covered flat elevated wooden boards on either side. The pin must be pushed into the groove at exactly the correct angle too, not leaning either to the left or to the right, not leaning forward or backward, and the base of the wings must end up level with the cork-covered wooden boards. It is a complicated, fiddly procedure that requires years of practice. 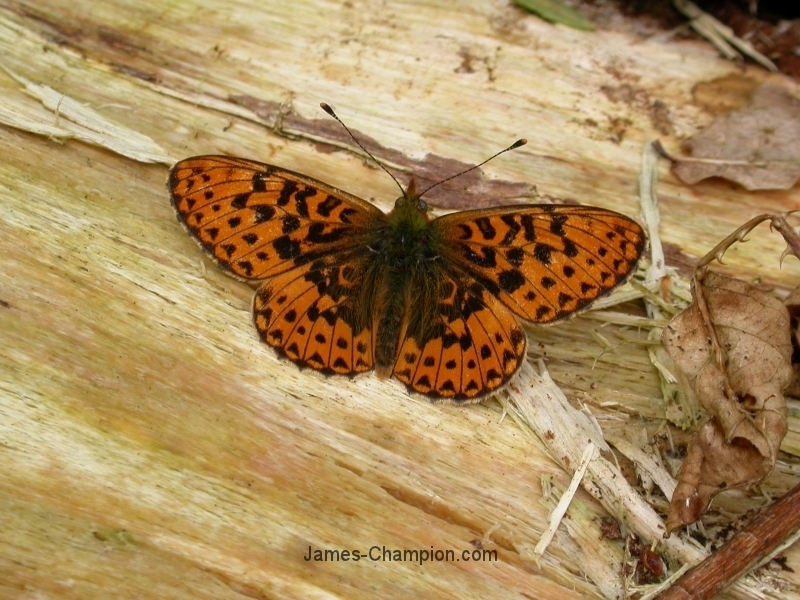 The wings of the butterfly are then flattened out with strips of thin paper, and pinned down around the wings. Using a setting needle placed carefully behind the veins on each wing, the wings are carefully manoeuvered into the desired position, usually with the rear margin of the forewing at 90 degrees to the body. Pins are then inserted through the paper around the wings (but not through them), and another strip is pinned around the outer half of the wings to prevent the wingtips from curling up. Finally the antennae are pinned into a position parallel with the front of the forewing. 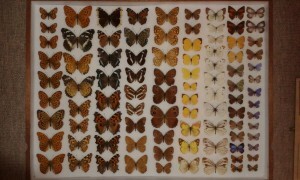 Once this has been accomplished (each butterfly takes 15 minutes or so), the boards are then left for up to a month to dry, in as pest-free a place as possible, as wasps and ants will eat the bodies, and there is nothing worse than finding that one’s prized specimens have been reduced to mere wings, the bodies eaten away by pests. I have a so-called setting house, a wooden box that can hold about 15 boards (depending on the size), and this prevents such attacks. The excitement of removing the paper strips from the wings is one of the most satisfying experiences I know, and what had looked like very tired and disfigured specimens come out looking as if they had only recently been caught, rather than being more than 110 years old. 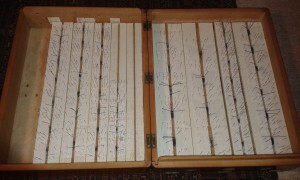 The next stage is to arrange them in the newly “corked” drawers. The original layout was almost at random, with South American, Australian and African specimens all jumbled up. 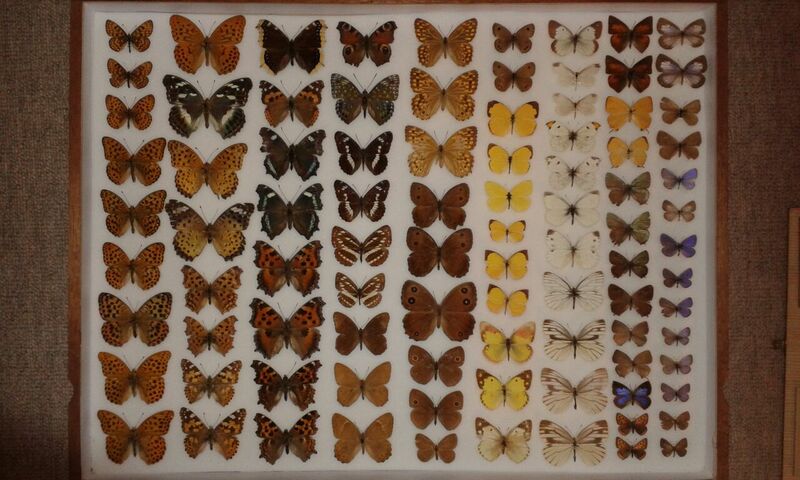 My new layout has North American, South and Central American, European, Australian and New Guinea, and African butterflies (and moths) appearing in their own drawers, arranged within those geographical categories by family. Asia has been split up into Indian and Burmese, Taiwanese, Japanese, Peninsular Malay, and finally a number of separate Dutch East Indies (Indonesian) islands, each of which has a very distinct fauna. Perhaps the one great disappointment is that the tiny labels that were originally pinned under each specimen have in many cases disappeared. These labels are absolutely vital in any insect collection, as they record the locality, date, and in some cases altitude of where the specimen was caught. 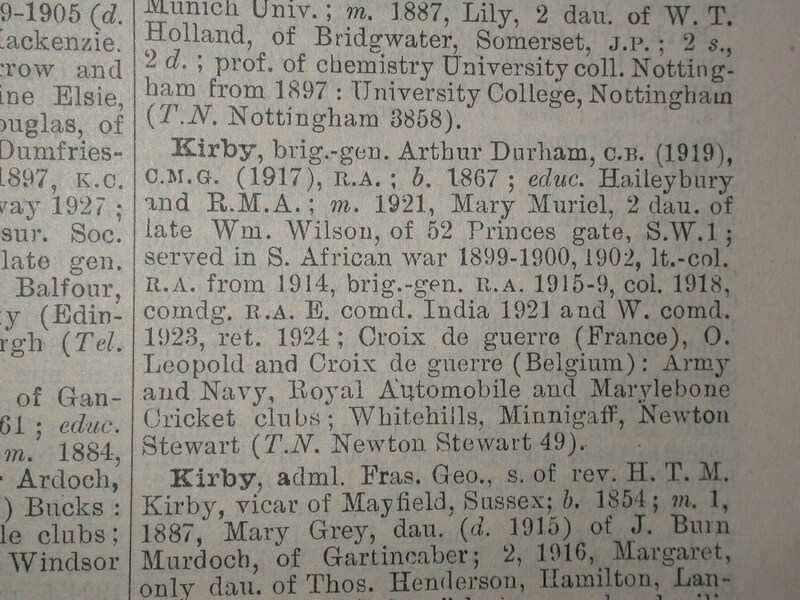 Gen. Kirby wrote this information on extremely thin and flimsy paper, and over the decades, the paper has deteriorated and the labels have fallen off the pins, probably when the specimens were re-arranged at some later date. In addition, he often wrote the location where his supplier lived and sent the specimens from, rather than where the insect was actually caught. 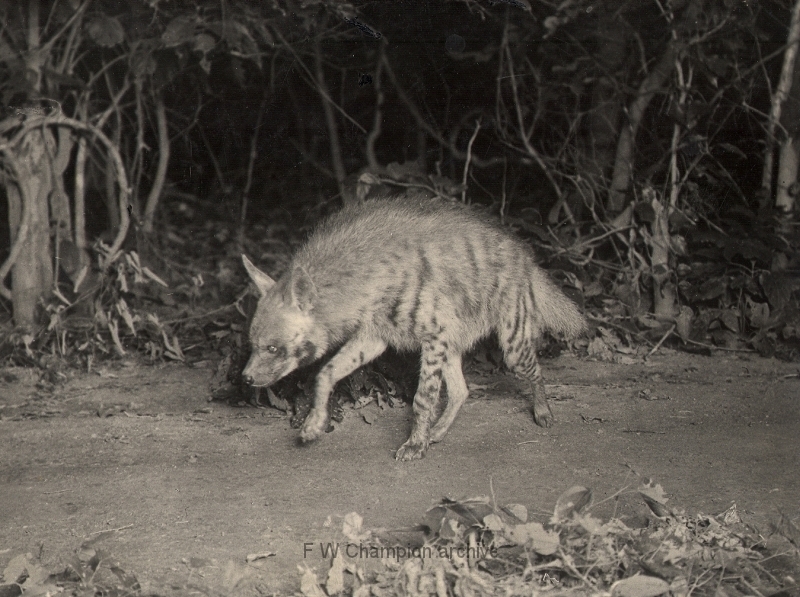 So, for example, most of the Japanese specimens (these have somehow retained their labels) are recorded as “Yokohama, June 1912″, or “Kobe, July 1912″. Yokohama and Kobe were ports where many foreigners resided, and the specimens were shipped from there. Some of the species occur only in high mountain areas, so they clearly could not have actually originated from either of those two cities, both of which are at sea level. This apart, I am making solid progress, and as of early 2015, I have completed ten of the fifty drawers (five of which contain no specimens, and two of which are missing their glass lids). The main obstacle is the fact that I work abroad, and can only work on the cabinet when I am at home. 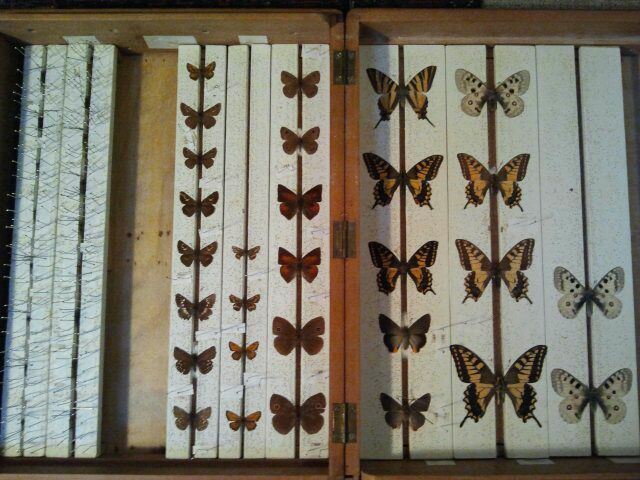 I am currently working on a drawer of European butterflies, sent from Colombes, France, in 1912, and on two drawers of butterflies from Formosa (Taiwan), containing some particularly beautiful specimens, caught in 1902. It always gives me a thrill to think about what the far off lands where these butterflies were caught must have been like in those days, and how much has occurred since then. While restoring these fragile insects, I really do have little pieces of history in my fingers. NB I wrote this post in January 2015, when all was peaceful in the Champion family. However, sadly my younger sister then launched an all-out attack on various family members, resulting in me being banned from the family home, so all work on the cabinet restoration is on hold until I am able to regain access.